A Fourth Drought Year for California: What Are the Odds? Vegas has nothing on Davis. 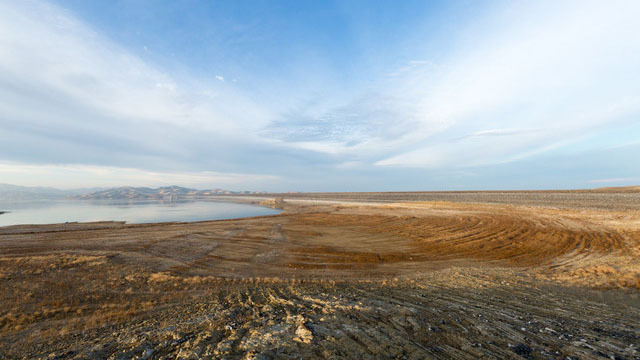 As talk turns to whether California's drought will stretch into a fourth year, two co-founders of the Center for Watershed Sciences at U.C. Davis decided to handicap it. Their conclusion: don't bet on wet. "In all, there’s a 71 percent chance that next [water] year will be Below Normal or drier and only a 29 percent chance of experiencing an Above Normal or Wet year. Based on 106 years of record, only 13 percent of years have been Critically Dry. But the odds facing California for next year aren’t as good. 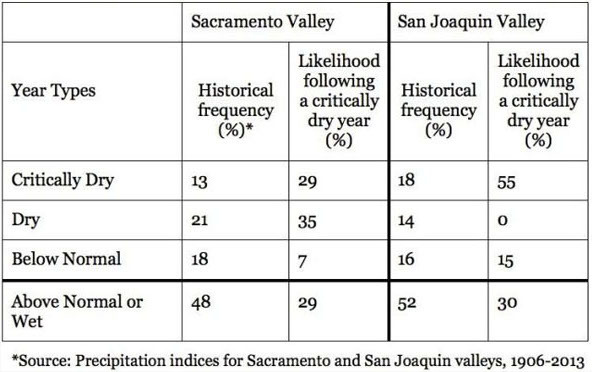 In the Sacramento Valley — the state’s largest source of water supply — there’s a 29 percent chance that the 2014-15 water year will also be Critically Dry, and a 64 percent chance that it will be Dry or Critically Dry — not favorable conditions for water management." Given the changing climate, I asked Lund if history is a reliable gauge anymore. "Well if history is no gauge, then maybe it's a 50-50 chance," says Lund. "But I think history is probably a better gauge than we'd like to think." Clearly as things stand, anything on the dry side would be bad news. "Even if we have a wet year next year, we're not out of the drought," warns Mount, a specialist in river hydrology. "We've drawn down so much on our groundwater, we have such low reserves within our reservoirs, and our soils are very, very dry." The two say that the likelihood of a longer drought isn't merely statistical. For instance, after an extended dry spell, soils tend to soak up more of the rain that does fall, and that reduces runoff into reservoirs. The current 2014 "water year" (ending September 30) is on track to be the third driest on record. Lund and Mount agree that betting on El Niño to bring rain and snow is a chump's game. In fact, says Mount, he and Lund were motivated to make their calculations in part because of all the "media froth" over the prospects for a rainmaking El Niño condition in the Pacific. "You could actually hear the response of people saying, 'We're going to have an El Niño next year, so everything's going to be fine." Not necessarily, says Mount, noting that Central and Northern California lie "at the swing point," where effects from the legendary oscillation are less predictable than in far Southern California or the Pacific Northwest. As for the Las Vegas metaphor, "Only a fool would make book on the weather," cautions Mount. "Our predictive capacity for year-to-year weather is very, very low."